Complete the look in your little princess's room with a lovely ballerina pillow. 100% cotton cover in a diagonal stitched quilted design. 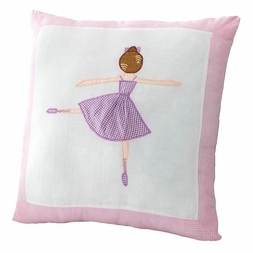 A single, graceful ballerina applique poises in a violet gingham skirt. Pink gingham border and reverses to a solid pink.